Do Edcamps do what they intend to do? How do we know Edcamps are effective? Do we even know what the goals are for an Edcamp? As a format for professional development, there is tremendous appeal for participants. Attendees invite others to a space and time to talk about issues that are important to them. How to organize one is clear, the process is clear... there is tremendous autonomy in the weekend format where participants are self-selected and enthusiastic to pursue professional development (PD) on their own time. Where the Edcamp format is used as part of a mandated PD experience, the audience is not self-selected which, one would think, would change the flavour of the event. What are the goals of an Edcamp? In order to measure whether an Edcamp is successful, it is useful to know what the intended goals are. The Edcamp Wiki advises Edcamp organizers to determine their own goals. It is clear that Edcamp is a process, a format or framework for engagement that accommodates both individual goals and an event-wide content focus. Nevertheless, it seems to me there must be some common themes or threads one could identify across Edcamps. 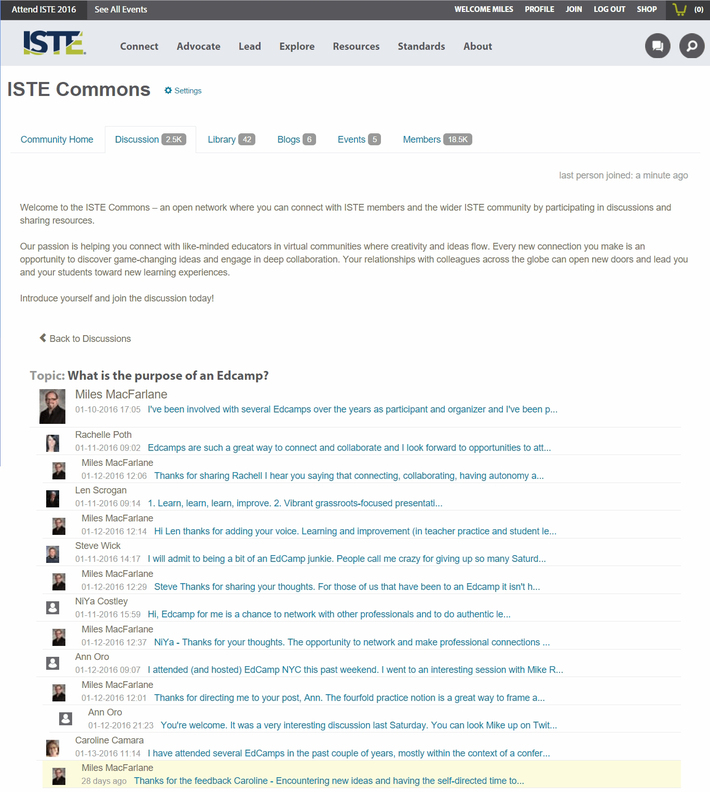 I started with a quick poll in the ISTE Commons discussion board asking the question, "What is the purpose of an Edcamp?" Responses shared the notion of connecting with others, sharing ideas. I also gathered 41 explicit goal statements from Edcamp sites, media coverage, and posts on Edcamps. Three themes stand out as goals of an edcamp: professional development, professional networking, and idea exchange. Individual participants will have their own goals, and the organizers may have identified a theme or focus for the event, but the Edcamp experience seems to orbit around those three elements. The SimpleK12 Complete Guide to Edcamps (p.21) suggest some survey questions for organizers to use after the event. What did you think of the physical location? What did you think of the date of the event? What did you think of the length of the sessions? How did you first hear about this EdCamp? Do you have any suggestions for publicizing the event next year? What do you think could be improved upon for next year? Would you be interested in being on the organizing committee for next year’s EdCamp? Most of these questions are helpful in guiding subsequent event management but focus primarily on logistical issues. Questions six and seven are very open-ended questions eliciting likes and possible improvements in the future. What is missing are questions that probe the extent to which Edcamp helps participants meet their goals, their exposure to new ideas, their networking opportunities, and professional development. As a voluntary weekend activity, Edcamps don't really require any great degree of accountability; that participants clearly find some value in the experience is probably sufficient to keep organizing and attending these events. However, with more districts and divisions adopting the practice within the school day as a PD event where participants are paid to attend, there is a greater need to demonstrate value for the investment. Some limited research into the contributions of idea spread, professional networking, and professional development offer a framework for exploring Edcamp's potential impact on teacher practice and student learning and are explained below. Emerging research in social networking and idea exchange has clearly shown a link between highly effective teams and the frequency and intensity of social interactions (Pentland, 2010, 2014). Frequent contact amongst all members of an organization is one hallmark of an effective team. Pentland’s (2010) studies empirically demonstrated that frequency of contact, regardless of the content, is highly correlated with team efficacy. He also indicates that networks can be engineered for maximum efficacy. He distinguishes between engagement and exploration describing everyday conversations with colleagues as engagement, and accessing ideas and resources from beyond one’s daily experience as exploration. Professional networking can be understood as having three primary activities: creation, maintenance, and access (Nardi, Whittaker, & Schwarz, 2000, 2002; Rajagopal, Brinke, Van Bruggen, & Sloep, 2012). Network creation involves connecting with new individuals with whom you intend to receive or exchange information. Network maintenance is keeping contact with others through ongoing information exchange. Maintenance need not always involve task-oriented conversations; keeping up-to-date with the life and goals of those in your network also contributes to team efficacy (Veletsianos, 2012). Network access is the use of resources in one’s network in order to complete a work-related task. Professional development is most effective when it has the teacher connect content to their own practice, when it focuses on the day-to-day needs of the teacher, and if it is part of a larger organizational movement in a particular direction (Darling-Hammond, Wei, Andree, Richardson, & Orphanos, 2009). If these conditions are met, the teacher is more likely to experience lasting change in their practice. Because participants are in active conversation rather than receiving information through a presentation, they are more engaged. Darling-Hammond et al (2009) indicate that teachers are more likely to try something new if they have seen it modeled, or have had the chance to play with the ideas first-hand. Finally, when professional development is connected to common organizational goals, it is likely to be more effective. Where each individual is pursuing their own professional goals during Edcamp, it was made explicit in the introduction that our shared goals were to spread ideas and network with each other. A simple and brief draft survey was created to measure these three areas and was tested at an Edcamp on February 5th in Winnipeg, Manitoba. Extreme caution must be exercised with this data due to the combination of the survey’s brevity and wide scope. With only one question targeting each of nine items, there is a large margin of error, not least of which may be the validity of the question itself. However, the data gathered does suggest participants found value in the experience. Based on anecdotal comments included on the survey, there was also widespread satisfaction with the Edcamp format. Over 80% of the responses for all categories and questions fell on the “like me” side of the scale with more than 65% indicating “True” and “Very True” responses in all categories. Questions 1 - 3 focus on ideas exchange, questions 4-6 focus on professional networking, and questions 7-9 address professional development. Each of these areas was broken down into three sub-categories each addressed by a single question. - To what extent are participants getting to know others, having casual conversations, learning the "other story". - Conversations outside the context of focused sessions. - Social conversations where people learn about each other and their situations. - To what extent are participants engaged in conversations about teaching and learning, taking in and processing professional content. - Conversations within sessions that are content focused. - Professional conversations where people learn about and explore specific ideas related to teaching and learning. - To what extent are participants engaged in talking about newly encountered ideas. - Social conversations where people share what they have learned or experienced at the event. - To what extent are participants establishing new professional connections. - Implied exchange of contact information and intention to engage after the event. - To what extent are participants nurturing established professional connections. - Implied history of contact and satisfaction in the connection. - To what extent are participants engaging with established professional connections. - Implied need/desire for contact and professional engagement. To what extent did the Edcamp experience relate to participant’s professional skills. To what extent did the Edcamp experience likely to help learners under the participant’s care. To what extent did the Edcamp experience relevant to the participant’s larger community. Some participants rated their experience in networking as very low but explained that they used their time working with a small number of known colleagues to collaborate on learning activities. The results for the PD section (Q7-9) were tightly clustered in the extreme positive end of the scale suggesting the wording of the questions contributed to social desirability bias. This section will have to be revisited. I'd really appreciate hearing from others who are pursuing similar lines of inquiry into open space type professional engagement. Thoughts on the question wording, or supplemental questions to probe more deeply in these areas are also welcome.